Adored by all, worn by the stars and wanted by the thousands, to look as good as their heroes, custom painted helmets remain the ultimate accessory for any aspiring rider. Confined in the small village of Tytherington, near Macclesfield in the wealthy county of Cheshire is the unlikely home of one of Britain’s most respected and certainly hottest helmet painters in the off road world. Lee Fareham is the face behind the famous D-ZIGN logo that over the last 3 decades has appeared on an ever increasing number of celebrity’s helmets as the finishing touch to some of the most wicked, universally recognised paint jobs. Look across any start line and you will see Clubmen through to British Champions to World Champions topped by Lee’s creations. 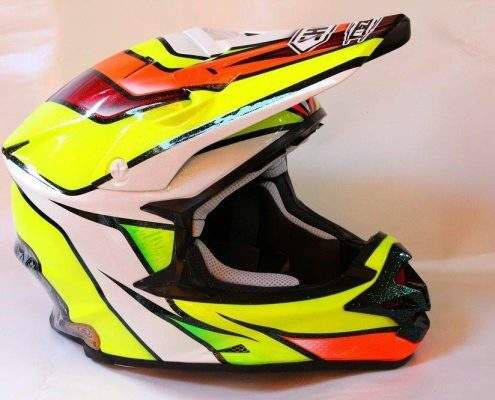 From the dirt bike world of Moto Cross to Trials, the Karting world to Motorsport, Street Bikers to GP riders and everything in between from Mountain Biking to World Rally drivers, all are wearers of Farehams spray magic. 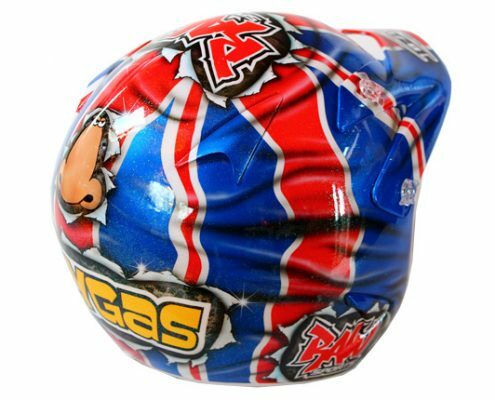 As well as being commissioned by individuals and both the Motocross De Nations and ISDE teams on numerous occasions, Lee has also created designs that have been replicated by Arai, AGV, Bell and OGK. Having served his apprenticeship as a traditional sign writer and coach painter, Lee then progressed into the world of vehicle body repairs. Lee soon established himself as one of the best men in the business. Unfortunately, his career took a blow, as he badly broke his ankle whilst riding Motocross. Unable to walk for sometime, Lee knew that his career would have to take a different path. A friend and fellow motorcycle enthusiast guided the injured Mr D-ZIGN into a new career when he commissioned two paint jobs for his use. Unknown to him, these helmets would be the first in a long line of glorious and highly original designs by D-ZIGN. The rest is history, but for Fareham the future is fast and never ending. 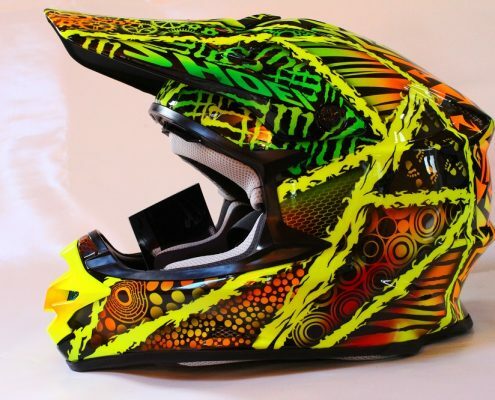 For the last 30 years Lee has used his lifetime of paint experience to incorporate some of the latest materials and techniques to keep creating helmets that are ready to race further into the new millennium.